Can I login to the LikeCoin ID by Social accounts? How to login by Google / Facebook / Twitter, if I used to login by MetaMask only? You used to login by MetaMask wallet, and want to login with Google / Facebook / Twitter now. Login with your wallet first, if you did not bind any social media account before. Visit https://like.co/in/settings . Connet to your Google / Facebook / Twitter account there. 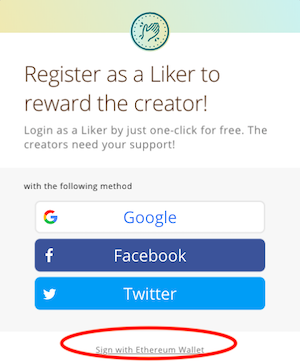 Once you have successfully connected to your social accounts, you can login your LikeCoin ID on your mobile with popular browsers such as Chrome/Safari. Note that Social account login by Trust browser is no longer supported.